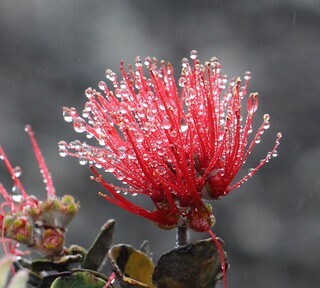 An ‘ōhi‘a flower with both stamens and pistils. ‘Ōhi‘a is the most common and important native tree in Hawai'i and endemic to the islands. Kaulana Manu / Kipuka 21 trail, Saddle Road, Hawaii Island, Hawaii.